Jurassic hangover | Blog the world!!! 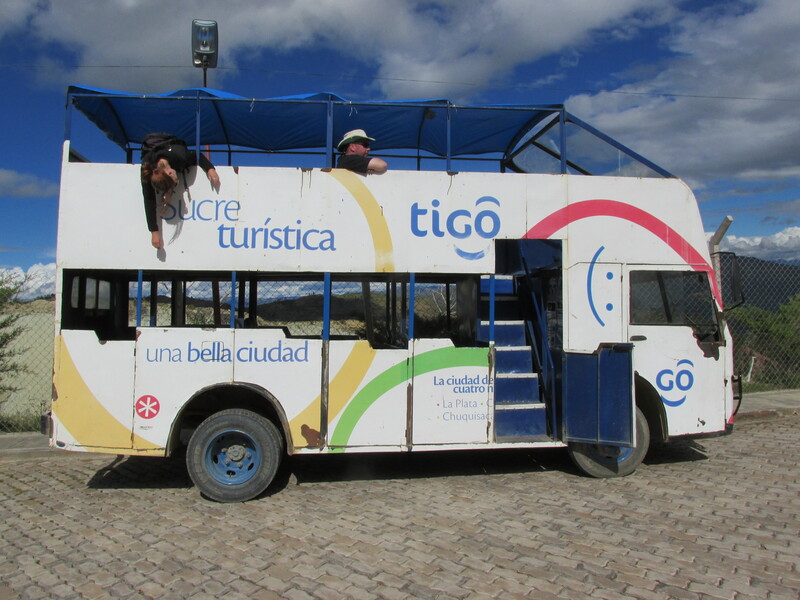 In Peru we made friends with a lovely couple who had just travelled through Bolivia. In that worldly way travellers tend to do we drank an awful lot and discussed the world, set it to rights, swapped tips and had a pretty drunken high opinion of ourselves. What’s wrong with that? Exactly, nothing. It’s because of that night that we’re now in Sucre, a white washed town in the middle of Bolivia. It’s pretty, full of typical Bolivian markets and there are Joyerias (Jewellers) everywhere. Sucre is also the home to the geekiest stop on our tour – Jurassic Park. Ok, so it’s not the real Jurassic Park but it is a dinosaur themed park which holds the longest vertical dinosaur tracks in the world. The park has several huge models of dinos and a tour of a dino museum. We were told about it by the couple in Peru and decided there and then that it could be the best attraction we’d ever go to (forget the Inca Trail, forget the Taj Mahal, this was it) so we added Sucre to our stop list. If you’re thinking of going to this attraction based on what I’ve written so far, I should warn you that there are no moving dinosaurs, no multi-coloured car tours and no helicopter rides. There are no children hating archaeologists learning valuable lessons and there are no old men with big ideas but little ethical values. In short, it’s not like the ‘real’ Jurassic Park. And in all honesty we found it hard to spend longer than 30 minutes there. I imagine once we left it all kicked off and the fake dinosaurs started breaking toilet cubicles and ripping people’s heads off, but as it was for us the bus ride was one of the highlights. It was the funniest looking little broken do-it-yourself bus we’d ever seen. The chairs were office chairs that had been nailed to the floor and the windows were… not there. After spending the rest of the day looking in the various Joyerias for engagement rings to no avail we decided to celebrate our engagement properly with steak and wine. We found a place called La Taverne which served by far the best steak either of us had ever had. Then our engagement celebration turned into a ‘we’ve found the best steak we’ve ever had’ celebration and that called for more wine. Now it’s time to leave Sucre and we’re both very hungover. I’ll be honest the dinosaurs didn’t really live up to our Jurassic expectations but we’re gald we came. The steak was amazing, it turns out Bolivian wine is, shall we say more-ish, and we’re leaving in the same way Alan and Ellie did from the ‘real’ Jurassic Park – dishevelled, drowsy, satisfied and worried that we might not make it through the day. But I think we’ll be ok because life… finds a way.